Honey is a sweetener bees produce from flower nectar. A beehive contains approximately 60,000 honey bees that collectively fly about 55,000 miles and gather nectar from two million flowers to produce 1 lb. of honey, according to the National Honey Board. Ancient civilizations used honey as a medicinal treatment for a variety of health conditions. Honey provides both health benefits and a couple of contraindications. A 1-tbsp. serving of honey provides a variety of nutrients, including 17.3 g of carbohydrates, a trace amount of potassium and calcium and 64 calories. The glycemic index score assigned to honey by Harvard Medical School is 55, which categorizes it in the mid-range for its impact on blood glucose. Consuming honey does not markedly elevate blood sugar, unlike table sugar, which has a glycemic score of 100. Frequent occurrences of blood-sugar elevation can cause low energy and weight gain. Honey was the principal sweetener until the 1500s, when the advent of mass sugar production relegated it to a smaller dietary role. 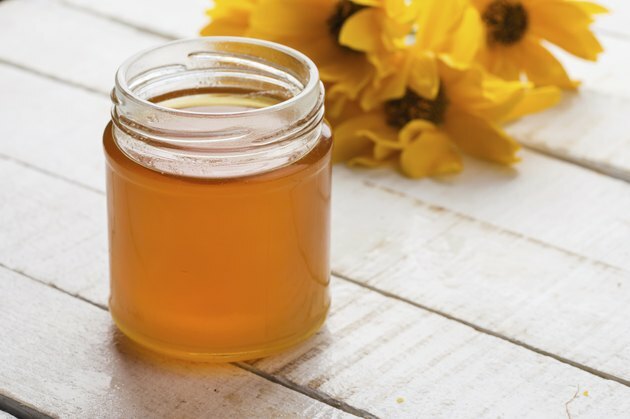 Honey provides antioxidants that protect cells in the body from structural damage that toxins cause, which leads to development of diseases such as cancer and cardiovascular disorders. The darker the honey, the higher its antioxidant content. Raw honey is particularly high in antioxidants compared to heat-processed honey that provides fewer benefits. The medical community uses honey for healing wounds. At the University of Bonn's Children's Clinic in Germany, doctors use honey to heal wounds in immunocompromised patients who experience slow wound healing. In 2006, doctors reported that honey healed wounds that originated years earlier. Resistant to antibiotics, these wounds healed two weeks after the application of honey. The healing powers of honey need more intensive scientific research to corroborate these positive anecdotal findings. Botulism caused by ingesting honey is a concern for children younger than 12 months. Botulism is a type of severe food poisoning that affects about 110 people each year in the United States, according to the KidsHealth website. The bacteria that cause botulism sometimes proliferate in honey. Only infants younger than 1 year are not resistant to the strain and the amount honey sometimes provides. Honey allergies may affect people who have a history of pollen and bee allergies. As well, a diet high in sugar, including honey, could contribute to weight gain.